We’re always working on ways to help Dojos get more value out of the Dojo events they publish on the CoderDojo platform, Zen. Here are the top releases we’ve completed in the last 30 days to achieve this goal. If you use event management and ticketing on the CoderDojo platform, we now show on the search page whether your Dojo has an upcoming event! Below is a example of how it looks right now. This makes it much easier for parents. youths and prospective mentors to find your Dojo to book into it. This works if you created your events on the CoderDojo site or used our very handy Eventbrite plugin to show your Eventbrite events on your Dojo page. We also use your recent past events on your profile page to indicate how often you hold your events. This shows parents that you regularly hold events and if they join they’ll be notified of your next event automatically, saving you and parents time. Create your next Dojo event on the platform and try out these new features for yourself! 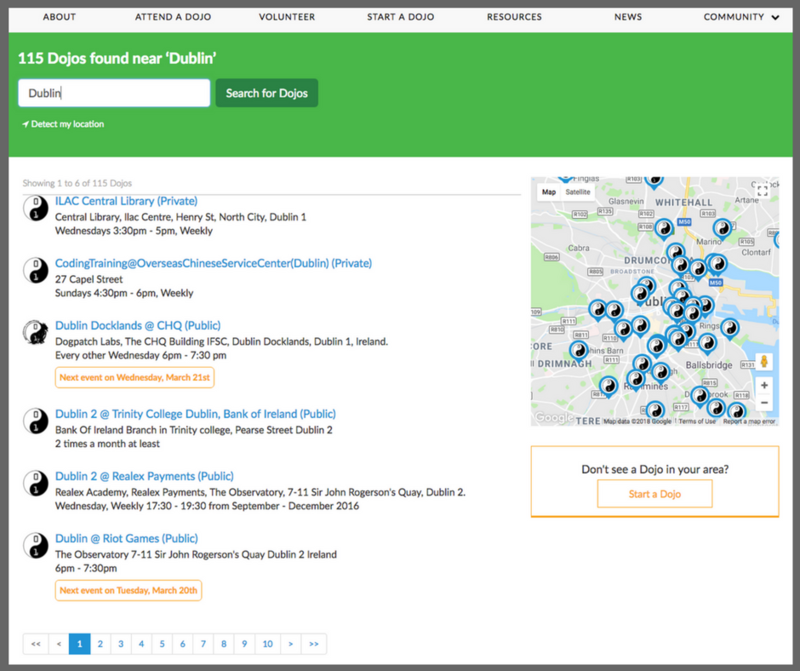 Or if you already use Eventbrite, quickly connect your CoderDojo account to it here so that it shows up when people search for their local Dojos on the CoderDojo website. We like to stay agile to what the community needs most but we’re hoping to have big news for the parents experience on Zen in the next few months, so hang tight for that. Besides that we will continue working on stability and a lot of smaller tweaks to make sure you and your Dojo members find the CoderDojo platform as useful and benificial as possible. If you have any comments or want to chat you can reach me on [email protected] or share your ideas or questions with the wider community on our forums. We’re looking forward to building more tools that enable more kids to get involved in the amazing Dojos around the world!